AVL | Magnum Electronics, Inc.
Our website has been upgraded to improve internet security for our Magnum AVL Fleet Management customers. The upgrade eliminates the Google Chrome Browser non-secure warning, adds encryption, and shows a lock in the browser address bar as shown below. To connect to the secure server, enter https://avl.magnumelectronics.com in your browser address bar (or click on the link).. You should connect to the login page with a padlock icon to the left of the url address. Enter your login info and save as a bookmark or add to your home screen if using a smartphone. This should save your login info and provide a secure one-click link to your Magnum AVL fleet management account. You may have heard excessive speeding can reduce fuel economy but few of us know how much it costs. We found some useful information compiled from DOE data. Your vehicle’s fuel mileage decreases once it exceeds optimal speed. For most vehicles, this is happens at about 55 mph. Every time you go over this speed, you’re wasting fuel and money. A slight decrease in your highway driving speed can significantly reduce your fuel consumption. According to studies backed by the DOE, the average fleet vehicle will be at its advertised peak efficiency MPG at 55 mph. As speed increases you can lose up to 28% of fuel efficiency when traveling at highway speeds. Our Magnum AVL GPS fleet management system has two types of speed alerts. The first is a high speed alert. Set the threshold at, for example, 70 mph and if a driver exceeds that threshold you can be notified (or get a daily report of all violations). The second alert is “posted speed” alert. Set this alert to be triggered if a driver exceeds 12 mph over ANY posted speed limit on any road. Alerts can be sent to your email or phone but you may want to have a daily or weekly report sent to you showing all violations with exact time and location. Here are short videos explaining how to setup alerts and reports to coach your drivers. Provide recognition to those with the least violations and watch your fuel bill drop next month. Contact Anthony at our Dover office (302-734-9250 8-5pm EST) for more information and a demonstration. Our low cost wired and plug-in trackers can be purchased, leased, or rented without a long-term contract. If you have storage trailers or construction equipment scattered across the state or job sites, it can be difficult to keep track of their location. It can be a time-consuming process to find them resulting in wasted labor hours, lost revenue, and equipment write-offs. The enhanced Magnum AVL 660-BAT is designed for mounting on the top of your equipment with four screws. There are no wires or external antennas and the internal battery will last 3-4 years. 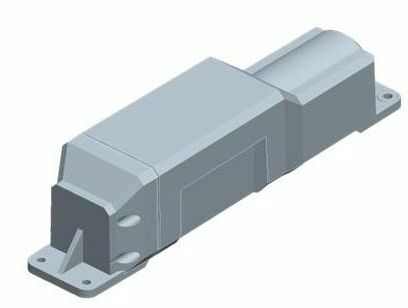 The rugged design is rated IP67 for outdoor use and it can be painted to match your equipment. It uses the Verizon Wireless cellular data network and includes a sensitive GPS receiver for location based tracking. It is only about 10 inches long and 2.5 inches high and weighs 25 oz including the battery. 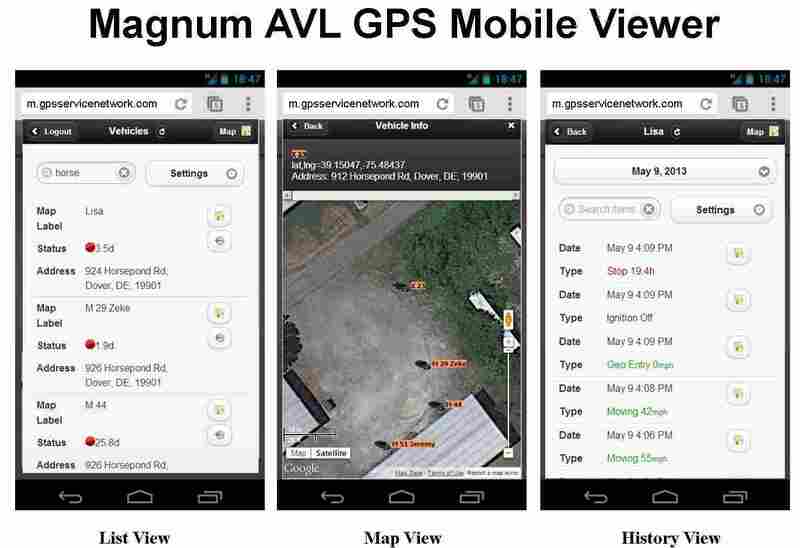 Track your assets from any computer or smartphone using Google Maps with the Magnum AVL web interface. Satellite, and street views make it easy to locate your equipment. The control panel shows all your assets and their location. You can also track your vehicles on the same map. Assets can be grouped, edited, and assigned different icons for easy viewing. Your history is stored online for 18 months or set up automatic reports that can be printed or emailed at regular intervals. The 660-BAT sleeps between updates to conserve battery life. It automatically reports map location with address every 12 hours. The time is of day is set by removing a magnet to start the 12 hour cycle. Considering today’s labor and fuel costs, the investment in Magnum AVL GPS tracking is quickly recovered. The 660-BAT including the service plan based on a 3 year lifespan is about 50 cents per day. Keeping a work crew waiting can be hundreds or thousands in extra costs. Fleet managers, government agencies, and small business owners can now try GPS fleet management without a significant investment or long term contract. For only $239, you can pilot our ODB-II plug-in or wired tracker for 6 months. At the end of the term you can return the device, rent it, or purchase it at a discount You can cancel anytime after 6 months with a 30 day notice. Our Magnum AVL GPS fleet trackers have an internal battery and will continue track for almost an hour if unplugged. They automatically update every 60 seconds plus turns using the Verizon Wireless cell network. A built-in accelerometer will track harsh driving and provide alerts using the posted speeds of the roads traveled. During your pilot we will provide a personal trainer to help you get the most out of our web based user interface. We will setup custom reports, alerts, and landmarks for your most common stops. We use Google Maps and keep the information on our servers for a minimum of 18 months. You can also download the data to a spreadsheet or have it emailed on a regular basis. For a closer look at our web interface, watch our “Getting Started” video. To locate your vehicle’s OBD-II port click here. Sign up here to get started. For more information, contact our Dover, Delaware office at 302-734-9250 or use the form below. Business owners and government agencies with small to mid-size fleets can experience the benefits of GPS vehicle tracking without a long term service contract. 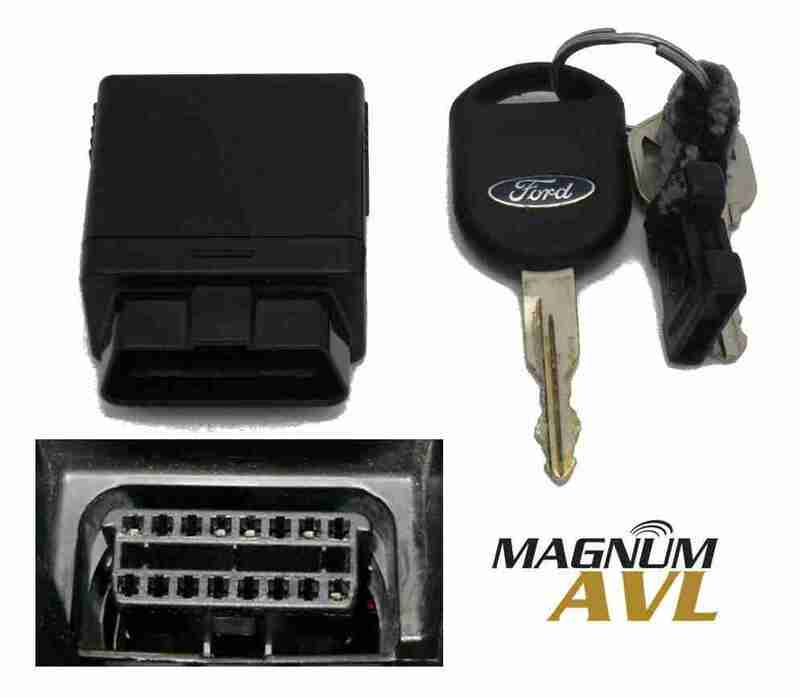 Our Magnum AVL Rental Program includes wired or OBD-II plug-in trackers and service plan with automatic updating. Track your vehicles using your desktop computer, tablet, or smartphone. Magnum AVL fleet trackers utilize the Verizon Wireless nationwide network. Your vehicles, backhoes, and trailers are tracked using our cloud-based software using Google Maps with satellite, traffic, and street views. Our trackers have a backup battery and will send disconnect and reconnect alerts as well as continuous updates for up to an hour. Email and text alerts are available based on location, posted speed, excessive idling, and harsh driving. Detailed, comprehensive management reports provide fleet data daily, weekly, and monthly.. 20+ reports can be automatically emailed, exported to a spreadsheet, or saved in .pdf format. We offer installation services, telephone support, and free training webinars. If you have a mobile workforce, Magnum AVL will impact your bottom line. Contact us for a quote using the form below or call us at our Dover, Delaware headquarters at (302) 734-9250 M-F 8-5:00pm EST. Can You Identify Your Fleet’s Idling Hidden Cost? Unnecessary engine idling reduces your fleet’s miles per gallon and increases maintenance costs. Most vehicle manufacturers now recommend a maximum of 3-5 minutes of idling before either turning off the key or beginning your trip. 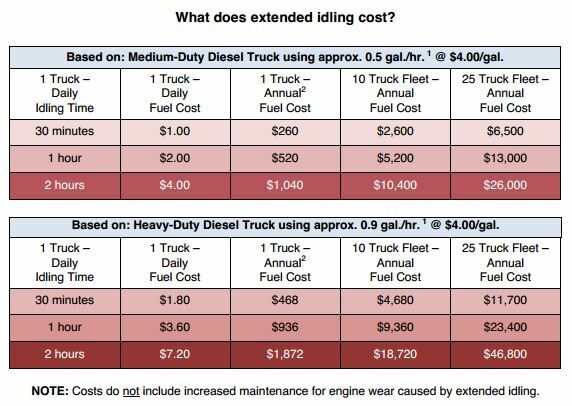 According to http://idlefreevt.org a medium duty (class 3-6) diesel or gasoline truck burns 0.4 to 0.6 gallons per hour. A heavy-duty (class 7-8) diesel truck burns 0.8 to 1.0 gallons per hour. How much idling is right for your fleet? It depends on many things and starts with your ability to be able to measure the “as-is” of each vehicle. You can only manage what you can measure. Magnum AVL GPS equipped vehicles automatically track the idle time of each vehicle. 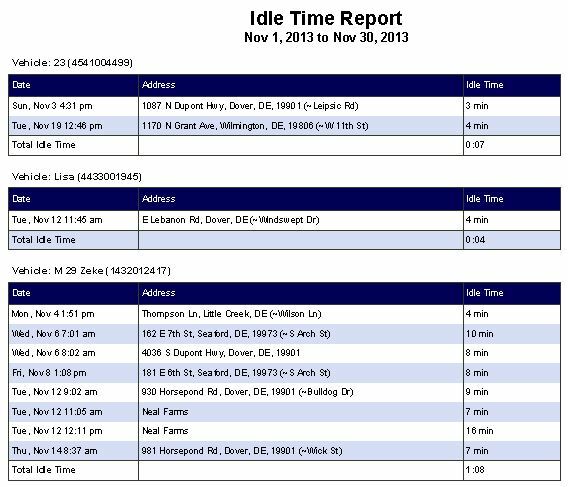 The idle time report requires only 4 mouse clicks and will provide your fleet totals by truck during any period of time you choose. The report will show the vehicle, date and time, and the number of minutes of idle time. It will also provide a monthly total for each vehicle. Choose “Automated Reports” so it will be emailed automatically to anyone each day, week, or month. As fuel prices rise, more business owners and managers with smaller fleets are looking at GPS tracking. It is difficult to compete in today’s economy without the productivity gains of GPS fleet management. Some small business owners are concerned that installing GPS fleet tracking will cause a morale problem with their employees and possibly affect their “family” corporate culture. The tips below have been used by Magnum AVL commercial and government fleet owners who have successfully installed GPS fleet and asset tracking. Your good employees won’t mind being tracked. They carry the load when weaker or new employees pull down the team. If you use cell phones to communicate, GPS eliminates the “where are you” calls while driving. You will know when they are delayed due to traffic conditions. Dispatchers can also help drivers get back on track should they become lost. Proof your drivers were at the correct locations for “No Shows”. Backup for invoice disputes or complaints involving your vehicles. Recognize the drivers with the least amount of monthly idling time who save fuel. GPS reports can eliminate driver logs and provide time card info. Installing GPS tracking in some vehicles (but not all) can be viewed as favoritism and can be perceived negatively by the drivers who are tracked. If you can’t afford to do the entire fleet, look at a leasing or renting the equipment. Magnum AVL uses state-of-the art equipment with a 3 year warranty, a Google mapping interface, and no long term contract. We have customers from Delaware to California. Contact us using the form below to discuss your requirements or call us at 302-734-9250. Fleet location, speed, and history for up to 6 months has been optimized for Magnum AVL users with smartphones and tablets. Our new Mobile Viewer portal provides fast access from your Home screen. Set-up is simple and only takes a couple minutes using your same login info. Most users will want to change the default settings to hide the serial numbers and unhide the address fields. The same icons found in the desktop version make it easy to use the Magnum AVL Mobile Viewer. 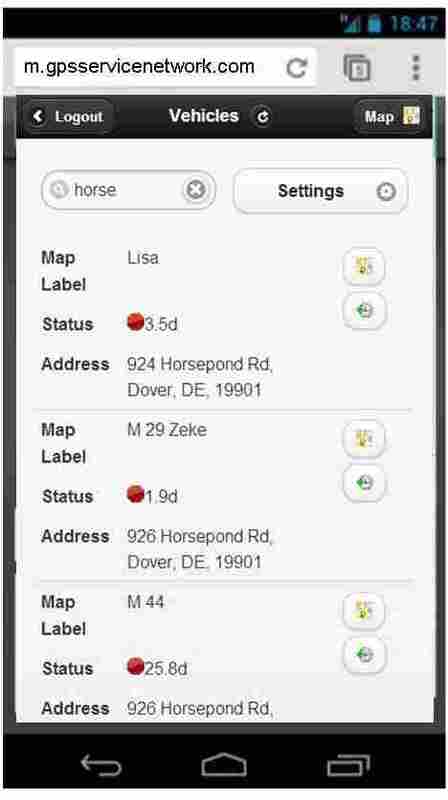 From the List View screen a simple button press will launch the Map View or the History View that shows speed and location data for the previous 6 months. 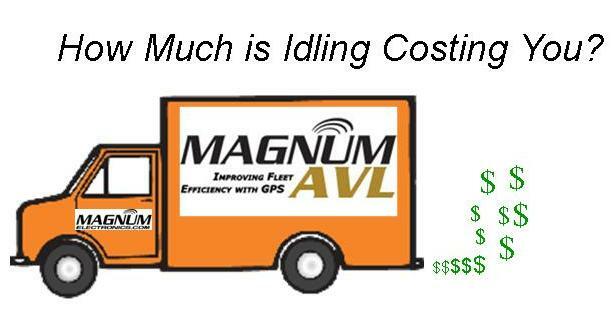 Magnum AVL GPS fleet and asset tracking provides reports with data that will help manage your fleet and reduce costs. Your fleet data is available for up to six months with the option of downloading or emailing the reports in multiple formats. 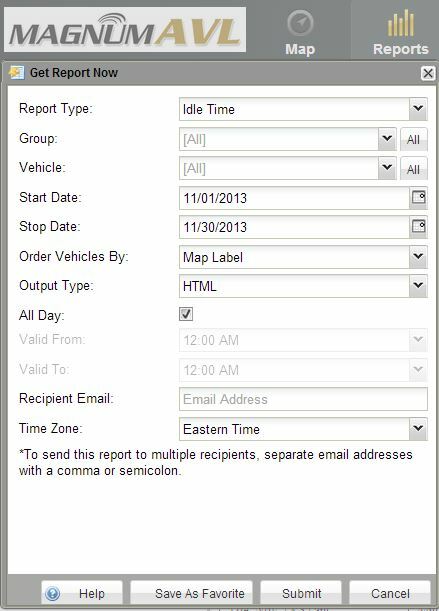 A couple clicks and drop down menus will let you select the report type, vehicle, time frame, stops, idle, speed, etc. Once the report is created it can be saved for future use and/or sent via email automatically. The purpose of this article is provide a list of the most commonly used reports with a short description so you can become familiar with them. 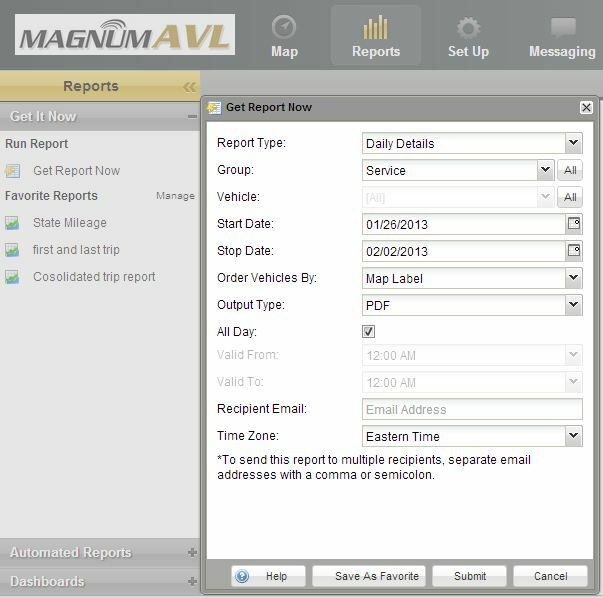 All of the reports are included with any of the Magnum AVL service plans. Shows the stop time, move time, distance, # of stops, # of geofences, # of Input Alerts, # of Speed Alerts of each vehicle by day. Shows the stop time, move time, distance, # of stops, # of geofences, # of Input Alerts, # of Speed Alerts of each vehicle for entire report period. Shows all of the movements for each vehicle between the start and end dates and between the hours specified in the report period. Shows all of the Geofence Alerts that occurred for each vehicle between the start and end date and within the hours specified in report period. Shows all of the Input Alerts that occurred for each vehicle between the start and end date and within the hours specified in report period. Shows all of the Speed Alerts that occurred for each vehicle between the start and end date and within the hours specified in report period. Shows all of the stops that occurred for each vehicle between the start and end date and within the hours specified in report period. Shows all of the current landmarks for this account with the times each vehicle entered and exited the landmark ordered by date. Shows when each vehicle entered and exited landmarks. Shows the start and stop times of the first and last trips of each of the days in the start/end date range. Shows the start and stop times of all the trips of each of the days in the start/end date range. Shows the first movement and last movement of each vehicle on each day. Shows the amount of time a vehicle has been idling (ignition on without movement). Distance each vehicle travels in each state over the selected period of time.. This is a summary of all trips and includes trip distance, trip time, idle time, and trip start and stop. In order for this report to work, the ignition wire must be connected. Will display vehicle movement events, ignition events, geofence events, stop events, over speed events, etc. Included in the report are time and date stamps for each event, as well as address, latitude/longitude, distance, and heading. Use this for backup detail with the State Mileage Report for IFTA audits. You must check the box “show addresses” to provide the required detail. A comprehensive report that summarizes start time, move time, stop time, idle time, end time, and total elapsed time during the reporting period. In addition to the data included in the Workday Summary, this report includes start and end addresses and off duty time during the reporting period. We are proud to announce the latest release of Magnum AVL 2.0 GPS fleet and asset tracking software. MAVL 2.0.15 includes new features based on your requests and feedback. Our goal is to provide the best fleet management user interface that is simple, powerful, and economical. The Workday Summary Report indicates Start time, Move time, Stop time, Idle time and End time for each day in the reporting period. The total elapsed time for the reporting period is displayed. Elapsed time is defined as the time period from the first Ignition On and the last Ignition OFF. The Workday Daily Details Report below contains everything in the workday summary report and also includes the Start and End addresses. Your vehicle can now send a text message or email when the battery is low. The power reconnect alert has been added for our soon to be announced OBD-II Plug-in MVP1000 GPS tracker, but can also be used to alert if the power is disconnected for other reasons. These new alerts work with any of our Magnum AVL GPS fleet trackers. A new column has been added to the control panel that shows the vehicle heading. This is helpful to determine which direction the vehicle is travelling. There is also column that shows vehicle mileage. You can customize the control panel to add/delete the columns you prefer to view. Adding landmarks (and geofences) is the key to getting the most out of your GPS investment. Landmarks are map icons you frequently visit such as your own location, suppliers, and customers. Landmarks provide additional data for fleet management and are a powerful tool to increase fleet efficiency. XSmall and XXSmall options have been added to the Radius dropdown menu of the New Landmark window in the Map tab. The XSmall is 40 meters in radius, and the XXSmall is 15 meters. A live webinar with our dedicated training specialist can be scheduled at your convenience using your Magnum AVL account and fleet data. We encourage you to take advantage of this free service. Send us an email and we will get it set up for you. If you don’t see the new features on your computer hover over the Help link in the upper right corner. If it is not 2.0.15 refresh your browser by pressing F5. You might have to close your browser too.